the Santa that you see with me...is none other than lil' Lanzi! my sister, her lil' baby, her hubby.....and my mama to be here tonight! that I am going to make a cheesecake...yay! and go to Forever 21 to return this super ill-fitting gold sequin mini-skirt and some other shirts that looked ok in the dressing room...but UGLYYYYYYYY.......when I got home...or actually I had thrown them in my suitcase, and thought I had a cute outfit on my last trip....but nooooooo way! Off to shower, shop, come back and clean my house!!!! And hope no one is reading this, but I bought all the girls in my family FELINE black liner from MAC, beacuse I love it so stinkin' much!!!!! hahahaha XD you are just AMAZING! Have a wonderful Christmas! And have an amazing time with your family! Merry Christmas to all and best wishes! A HUGE HUG AND LOTS OF KISSES! Witch a lot lot lot of luv <3! Happy almost Christmas to you too!!!!! Merry Christmas! I went to the Mac counter today just to get that eyeliner, and they didn't have it! I ended up getting engraved instead, and a few other things. They get me every time... hahaha. Christmas Eve Eve! Yay! Have a wonderous holiday!!!! Hope you have an amazing Christmas and New Year! As always love to read your Blog. Your hair in this picture is close to the way mine is now. I am so ready to have my long hair back. Next baby I am going to refuse and fight the erg to cut it off... LOL! Any way Hope you your family as well as your friends Celebrate and have the most fantastic Christmas holiday ever! Lanzi was so sweet in this picture! Your daughter Lanzi is so adorable! Aww so cute. I hope that your Christmas is WONDERFUL and awesome, and filled with tons of love and joy and all the good things. Happy New Year as well!!!! Hope that you are having a WONDERFUL time with your family! Give the little ones lots of hugs!!!! and leave out cookies for Santa! Christmas eve is here. I hope you have a wonderful time iwth your family Kandee! Kandee, if you aren't partner on your other channel you can post your neighbor's christmas lights there and Youtube won't mind if the songs are copyrighted! Have you and your loved ones a Merryly Little Christmas and may all your wishes come true in this new year coming. Can´t wait to spend 2010 with you and your videos.They´re great. They´re one of my best ways to get the everyday going, going on. Thank you so much for your high spirits and have a very Merry Christmas and waiting for a special New Year! OMG YAY i also made a cheesecake!!! 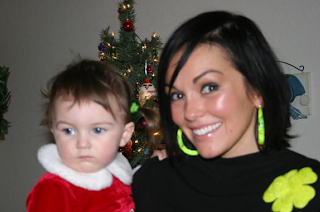 MERRY CHRISTMAS && BEST WISHES KANDEE!! !